Second cat.nr. as it appears on the label. 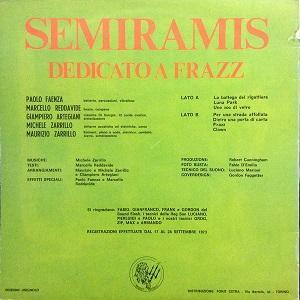 Semiramis was another Italian group that forged a substantial legacy based on one recording. Formed in Rome in the early 70s by the brothers Zarrillo—keyboardist Maurizio and vocalist Michele—the band also featured bassist Marcello Reddavide and drummer Memmo Pulvano. Like Cervello, they were all teenagers at the time. Also a guitarist, brother Michele joined in 1972, replacing the band's original vocalist. Then Semiramis earned a slot at the Festival pop di Villa Pamphili in Rome, held in late May 1972. Spread over three days, the festival featured dozens of RPI groups—including Banco, New Trolls and Osanna, along with Hawkwind, Amon Düül II and Van der Graaf Generator—playing to a reported 100,000 plus audience; yes, it was the Italian Woodstock. 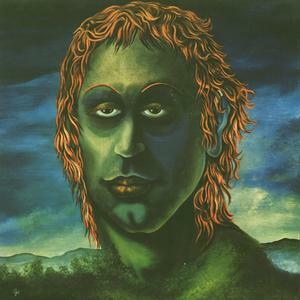 Adding drummer Paolo Faenza and keyboardist Giampiero Artegiani, Semiramis then signed to Trident Records and recorded their debut album, Dedicato A Frazz, which was released in 1973. "La bottega del rigattiere" ("The Junk Dealer's Shop") opens the album, revealing a dense rock progressivo Italiano. Layers of keyboards, vibraphone and guitar fill the soundstage as the song shifts through several themes. 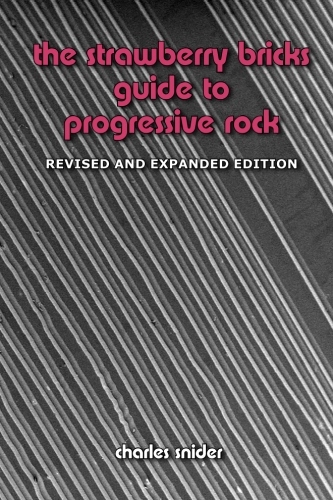 "Luna Park" jumps off frenetically before settling down, while the ensuing "Uno Zoo Di Vetro" ("A Glass Zoo") is the opposite; it scuttles its gentle beginning for something downright metal, shifts gears for a resplendent finale and then sideswipes again with a sideways solo vibraphone finish. You get the point: Semiramis pour everything into the mix. "Dietro Una Porta Di Carta" ("Behind a Paper Door") offers more of Michele's heavy guitar, while "Frazz" shifts violently between themes. The album stands as one of the most original and exciting displays of RPI, but it wasn't to last: Weathering further lineup changes, the band broke up after a final performance at the Villa Pamphili festival in 1974. Michele Zarrillo briefly joined Il Rovescio della Medaglia before forging a successful Italian solo career in the 80s.